Do you work for a brand that encourages customers to regularly log in to the brand website or app? Or that uses a credit card or loyalty program to track individual customer purchasing behavior online and offline? If so, then you have a powerful source of competitive advantage just waiting to be tapped: first-party customer data. I’m talking about the continuous stream of known-customer behaviors and purchase intent signals being produced as your customers interact with your brand across all of your touchpoints. This includes website and store visits, emails opened, products browsed and bought, content consumed, promotional offers redeemed, service center contacts and so on. What makes this data stream so valuable? In today’s engagement economy, consumers expect their favorite brands to recognize them and curate individually relevant experiences in every channel, at every touchpoint. This is especially true for a brand’s top customers who represent a disproportionate share of brand sales. You may be thinking, “Well, we already onboard customer data with our digital media vendors to suppress known customers from acquisition campaigns. And we serve special offers to customers in the top-tier of our loyalty program.” But the reality is, there are still too many critical moments when a brand cannot instantly recognize a known customer and apply everything the brand knows about that customer to deliver a truly relevant and highly engaging experience. Why? Because most brands do not yet have a system that supports both continuous customer identification and continuous updating of customer profiles across all those online and offline touchpoints mentioned earlier. Without a free flow of this data through the marketing ecosystem, you’re likely getting only a trickle effect on sales when you could have a firehose. Let’s examine five barriers that restrict the flow of customer data and how you can overcome them to unleash the power of continuous customer connections for addressable marketing across all touchpoints. 1. Time lag in data flow. Onboarding and batch processing of customer data takes time. If the brand can’t respond to a customer signal quickly enough, marketers will miss critical moments to provide real value to the customer. 2. Short-lived customer profiles. When cross-channel data is matched and unified at the customer-level, the resulting profiles can be activated for addressable ad targeting, website personalization and more. But when profiles are compiled and used for just one campaign at a time, the benefit of that knowledge disappears when the campaign ends. 3. Rented identity graphs that are limited to use within a single vendor’s platform. When you don’t own your brand’s ID graph, it isn’t portable for use across all of your marketing vendors and platforms. Therefore, you can’t optimize the customer experience across both owned and paid channels. 4. Incomplete customer profiles for targeting and customization of messaging. If profiles only reflect your customer’s desktop browsing and buying, you’re missing a significant share of customer interactions, e.g., on the mobile web, in apps, in physical stores and with service centers. Incomplete profiles impact both spending efficiency and message relevancy to customers. 5. Incomplete analytics that are limited to whatever the ad vendor chooses to provide. You don’t get customer-level results back to conduct your own attribution analyses. First, it creates an addressable identity for each of your known customers. This consists of a universal ID that is linked, in a privacy-safe way, to the brand’s own customer identifiers (e.g., email address and loyalty card number) and to the identifiers (e.g., cookies and device IDs) used by various marketing vendors. Second, it builds a customer profile containing the attributes you want to use to individualize each brand-customer interaction. Example attributes include online and offline purchasing history, content viewed, offers redeemed, loyalty tier and lifetime value. Third, and most importantly, your ID graph (which contains your customer identities and profiles) is continuously updated, 24/7, ensuring that all customer behavior is captured and integrated across all touchpoints, even when a customer changes devices or addresses. The ID graph can remain active for years, so it’s always fresh and ready for any type of marketing activation. 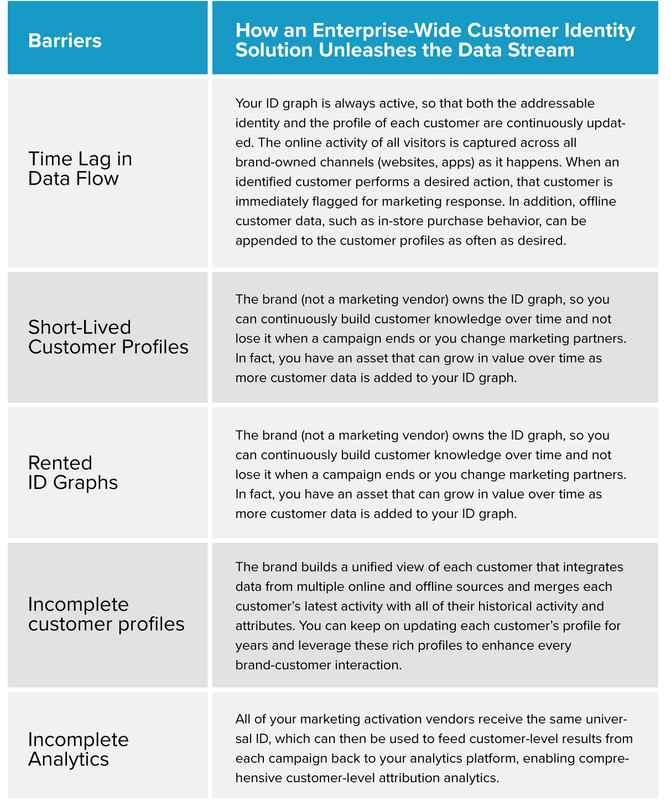 The table below explains exactly how you can break down the five barriers with the right customer identity solution. Once implemented, an enterprise-wide customer identity solution enables brands to instantly recognize their customers at any touchpoint and to deliver relevant messages based on each customer’s long-term relationship with your brand (not just their most recent action). Today’s always-on consumers don’t make it easy for brands to deliver a seamless experience across time, channels and devices. But with an enterprise-wide customer identity solution, you can deliver a far richer experience to your most valuable customers. What was only a pipe dream a couple of years ago is now being implemented by leading brands. Now is the time to act.